Briefing papers are produced by the Forest Stewards Guild based on relevant research from Coalition partners. These papers address foundational knowledge of fire ecology, wildlife, water resources and more. Recently published papers are available below. - Developed based on research by Manuel Lopez and the Burned Area Learning Network and produced by the Forest Stewards Guild. Read more about USGS’s modeling work. Learn more about post fire response: Post-Fire Treatment Effectiveness for Hillslope Stabilization. - Produced by the Forest Stewards Guild from research by Christopher H. Guiterman, Ellis Q. Margolis, Craig D. Allen, Donald A. Falk, and Thomas W. Swetnam. Fire History in the Greater Santa Fe Fireshed: Fire scars as a record of fire history. - Produced by the Forest Stewards Guild from research by Ellis Margolis, USGS. - Produced by the Forest Stewards Guild. 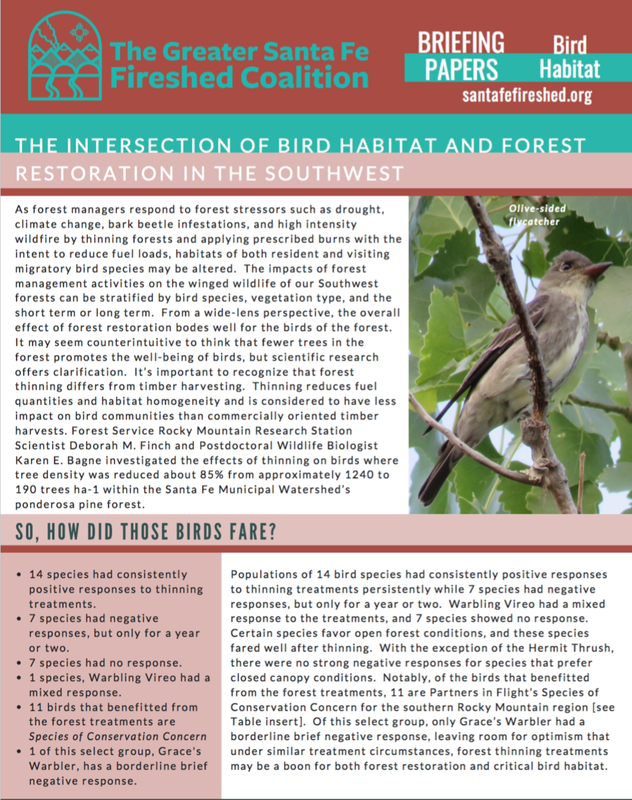 Contributing authors are Hannah Bergemann (USFS), Sandra Imler-Jacquez (USFS), and Alan Barton (New Mexico Forest & Watershed Restoration Institute). - Written by John Formby and Sherele Brooks, and produced by the Forest Stewards Guild. Based off of recent work from John Formby, Ph.D, New Mexico State Forestry, Forest Health Program Manager. - Developed by the USDA Forest Service Rocky Mountain Research Station Scientist Deborah M. Finch and Postdoctoral Wildlife Biologist Karen E. Bagne, and produced by the Forest Stewards Guild.